Secure: A tube should not require mountains of tape! The Guardhouse snap-tight lid fits snugly and secure, yet comes off easily with a simple twist and pull, as shown in this Youtube clip. 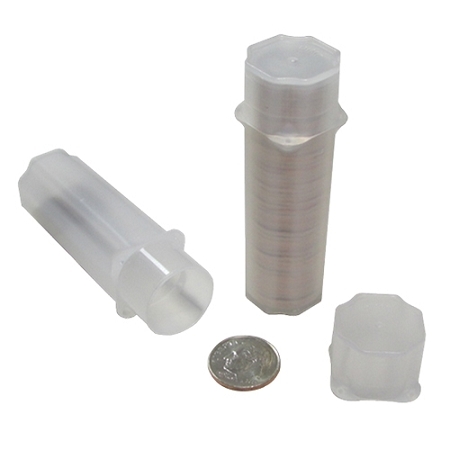 Translucent: Now you can see what’s inside, from the top, bottom and side of the tube, allowing you to quickly identify the contents and correct quantity. Easy-Grip: Thumb notches on the lid make it easy to remove an individual tube from within a group of tightly packed tubes. Stackable: Ledges built into the base and lid make for easy vertical stacking. Ergonomic: Fits comfortably in your hand. No sharp corners or edges. They are also available in cases of 100 same size.